You’re about to find freedom, clarity, and peace. How to identify a Dream that is custom-designed for you, your true calling and motivation in life. How to Unshackle by breaking free of others’ opinions, ending false guilt, embracing imperfection, and eliminating the multitude of distractions. How to Design a vision and system for your life that will end disorganization and map out a plan. How to Ignite your productivity and learn the secrets to creating habits that stick, priorities that matter, and focus that achieves. How to Recharge your energy as you stop working, experience true rest, and savor your life. How to Connect to a deep biblical community that encourages and supports your dream. A short book with life-changing results. It’s time to bring that dream to life, find the freedom of simplicity, get clear on your strategy, gain energy and health, and learn the balanced rhythm of work and rest. A fantastic life of Impactivity awaits. Get started on your journey today. Take the first step toward Impactivity. 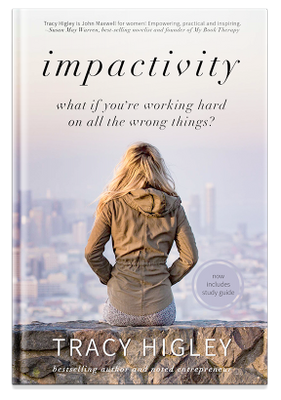 Tracy Higley, bestselling author and successful entrepreneur, has been where you are. After decades of keeping up with publishing contracts, four kids, church ministries and grad school, all the while running a million-dollar retail business, Tracy “crashed and burned.” And learned. Now she’s on fire to share those lessons with you – showing you how to fit your high-achieving personality into a structure that explodes your productivity while keeping you balanced, healthy and joyful.